Increasing incidence of physical damages caused to packaged goods due to improper shipping has propelled the demand for protective packaging, wherein foam materials have played an instrumental role. Developing foam protective packaging products continues to be cost-intensive task as companies are subjected to offer prototype sampling and custom fabrication. Moreover, designs of the foam protective packaging products continue to change on the basis of the dimensions of shipping containers and package sizes. In the foreseeable future, manufacturing foam protective packaging products is expected to be a challenge task as industrial regulations across the globe will continue tighten their grip on banning the use of foam materials in packaging products. In addition, the environmental protection agencies across the globe have been emphasizing the need to recycle and reuse the foam materials. This has led the foam protective packaging market players towards divesting their capital in procurement of used products, which has also impacted on their overall profit margins. Several companies are withdrawing their presence in the global foam protective packaging market for not being able to meet their sustainability targets. Factors as such are addressed as the key restraints that will impede the growth of the global foam protective packaging market in the foreseeable future. Transparency Market Research’s latest report has analyzed several factors and developed an insightful forecast on the global foam protective packaging market. Key findings from the report reveal that the global foam protective packaging market will reach a US$ 5.3 Bn valuation by the end of 2026. During the forecast period, 2017-2026, the global foam protective packaging market is estimated to reflect a sluggish growth at 3.2% CAGR. Advantage of urethane materials in terms of adapting to custom modifications in design and providing flexibility through advanced cushioning functionalities have driven their use in the global foam protective packaging market. In 2017, foam protective packaging products made of urethane have brought in over US$ 1.6 Bn in global revenues. The report further estimates that demand for neoprene materials is expected to gain traction. Over the forecast period, foam protective packaging products made of neoprene materials are slated to register revenue growth at the highest CAGR of 4.6%. The report further estimates that the e-commerce will be the largest and most lucrative end-use industry in the global foam protective packaging market through 2026. By the end of the forecast period, more than one-fourth share of global foam protective packaging market value will be accounted by e-commerce end-uses. The report also observes electronics & appliances, pharmaceuticals & medical devices, and consumer product manufacturing as lucrative end-use industries for the future of foam protective packaging. With respect to the applications, more than half of foam protective packaging products being manufactured will be used for cushioning and void fill applications collectively. The report estimates that the void fill applications of foam protective packaging will register highest revenue growth, and will bring in nearly US$ 1.5 Bn by 2026-end. Key companies partaking in the expansion of the global foam protective packaging market have been profiled in the report. The study observes Sonoco Products Company, Plastifoam Company, Pregis Corporation, Sealed Air Corporation, DRB Packaging, Volk Packaging Corporation, Wisconsin Foam Products, Rogers Foam Corporation, Tucson Container Corporation, and Armstrong Brands, Inc. as leaders in the global foam protective packaging market for the forecast period. The need to eliminate incidences of physical damages caused to a package and the goods inside during the shipping process has propelled the demand for foam protective packaging solutions. Shipping businesses across the globe are actively prompting manufacturers to use foam for providing protective packaging to their goods. From delicate components and sturdy equipment, foam protective packaging solutions continue to serve a range of packaging applications. Companies providing foam protective packaging to the products are actively focused upon delivering custom-made solutions fabricated on the basis of the shipping containers and package sizes. New designs to facilitate corner protection, edge protection, and shock absorption are being widely incorporated by companies in the global foam protective packaging market. According to Transparency Market Research’s latest report, the demand for foam protective packaging is pegged to witness steady traction in the foreseeable future. The report has considered multiple factors influencing the growth of the global foam protective packaging market, and developed insightful forecast for the assessment period, 2017-2026. By supplying objective information, the report aims to deliver solutions to the key concerns of foam protective packaging companies, and provides inferences that can enable them in planning their future strategies. For offering comprehensive research outlook on the global foam protective packaging market, several sections and sub-sections of analysis and forecast have been compiled to develop this report. From trade perspective analysis to statistical forecasting, the report amalgamated all the relevant data for foam protective packaging businesses and analyzed it across several parameters. To interpret market size estimations, metrics such as Year-on-Year (Y-o-Y) growth rates and compound annual growth rate (CAGR) have been used. Information on the socio-economic conditions of each regional market has been provided by considering the Gross Domestic Product (GDP) and exchange rates and consumer price indices. Key sections of the report provide segmental analysis on the expansion of the global foam protective packaging market. The report has segmented the global foam protective packaging market on the basis of material-type, end-user industry, application, and region. The taxonomy for analyzing the global market for foam protective packaging has been illustrated below. 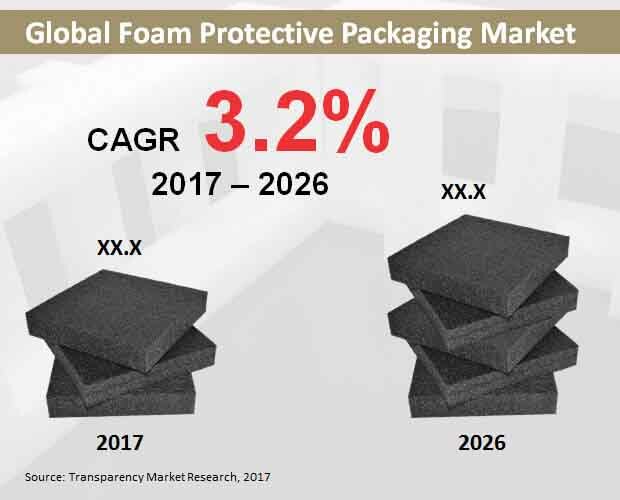 The report has also developed key insights on the industry trends influencing the production and sales of foam protective packaging products. Strategies for easy and cost-effective procurement of raw materials have been studied in the report. Cost structure and pricing analysis offered in the report is aimed to provide broader understanding on trades involved in the global foam protective packaging market. The report also provides analysis on the basis of macroeconomic factors and new business opportunities. Lucrative segments and untapped opportunities have been revealed in the report. Leading foam protective packaging companies have been profiled in the report to disclose the competition backdrop of the global foam protective packaging market. The status of these players in the global foam protective packaging market has been analyzed through multiple levels of research and validation. Unbiased analysis on the competition assessment is a key highlight of this report. Inferences provided in the report are aimed at enabling these players improve their market standings and gain business growth to maximum potential during the forecast period.